Family dinner conversations can often be pretty shallow and go something like this – Parent: “How was school?”. Child: “Good”. What did you do: “Nothing”. Parent: “Did you learn anything interest”. Child: “Nope”. Does that sound familiar? 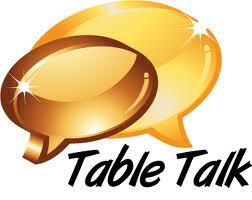 Make meal time significant through table talk that glorifies God and builds up your family to better honor and serve Him. This entry was posted in Family and tagged Christian family dinner conversation topics, conversations to prepare children for life, disciplining children through conversation, What to talk about with kids. Bookmark the permalink.